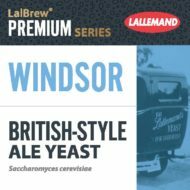 LalBrew® Windsor ale yeast is a true English strain that produces a balanced fruity aroma and imparts a slight fresh yeasty flavor. Beers created with Windsor are usually described as full-bodied, fruity English ales. Brewers choose LalBrew® Windsor to produce beers that range from Pale Ale to Porter with moderate alcohol levels and the flavor and aroma characteristics of the best traditional ales. Traditional styles brewed with this yeast include but are not limited to Milds, Bitters, Irish Reds, English Brown ales, Porters and Sweet Stouts.